Somewhat to my amusement, I discovered that the unrelenting passage of time had erased all memory of Lawrence East from my head, even though the stop was briefly my ‘home station’ many years ago. The dismal pedestrian tunnel at Lawrence East. Imagine walking through here every day. Back in my halcyon university days, I once spent a merry co-op work-term programming children’s games for the Scarborough Board of Education, along with three other fresh-faced troublemakers. Instead of working out of the main SBE office (in the Scarborough Civic Centre), we were stuck inside an anonymous, fluorescent-lit room on the second floor of the Charles Gordon Senior Public School, just south of Lawrence and Midland. To torment us, there was a radio tuned permanently to an easy-listening station, which we weren’t allowed to change: every day just past 3pm, without fail, These Eyes by the Guess Who would start playing, and we’d all croon along. I was too lazy to commute, so I rented an apartment on nearby Prudential Drive, a stone’s throw from the school—and from Lawrence East. That was a mistake, because at night-time there was precious little for a restless fellow to do in that neighbourhood—at least, that wasn’t mischief-related—so invariably I’d trudge over to the station, and take the SRT up to the mall at Scarborough Centre, or I’d head down to Kennedy and take the subway from there downtown. Returning to the station years later, I came to realize why I could recall nothing about it: Lawrence East is a transit backwater, practically devoid of anything remarkable to reminisce about—unless perhaps you are a fan of naked, barren expanses of concrete wall. I’m trying to think of another station matching Lawrence East for its lack of pulchritude. My other candidates each have some redeeming qualities: e.g. due to its scale, Warden has a brutish vitality; the exterior carapaces of Glencairn and Keele conceal interiors that delight. And while Museum has been unforgivably tarted up by hooligans, at least it’s fun for the kids. Hmm. Perhaps Ossington or Leslie. I would nominate Midland, but I already wrote that I approved of it due to its mournful ambience, so that would be hypocritical of me. Hypnotizing space-age lighting. Note also the netting to keep birds from roosting in the ceiling. The one pleasant image I took of Lawrence East. Enjoy. 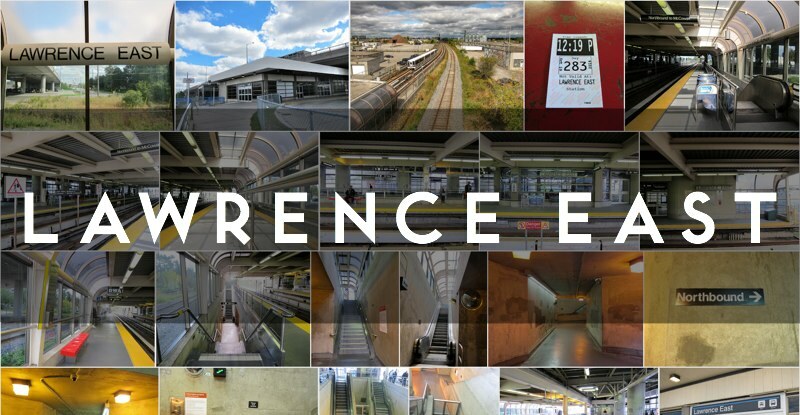 Lawrence East officially opened for service March 22, 1985 as part of the Scarborough RT line (though the station was previously used as the end point for the RT’s inaugural run from Kennedy on July 5, 1984).